Crews are on the scene of a Saturday afternoon crash in Parkville/Carney. 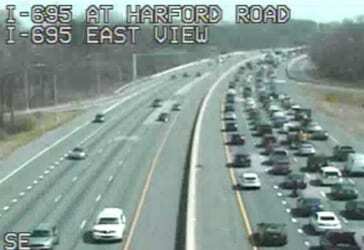 Advertisement The crash was reported at about 2 p.m. along the inner loop of I-695 between the Harford Road and Belair Road exits. The two left lanes of the inner loop have been shut down. Heavy delays are present in the area. Motorists should use an alternate route. Crews are on the scene of a Sunday night crash in Fallston. At just after 10:30 p.m., high winds knocked down a tree in the 2800-block of Harford Road. The tree reportedly fell onto an occupied vehicle. Injuries have been reported. Motorists should use caution in the area.